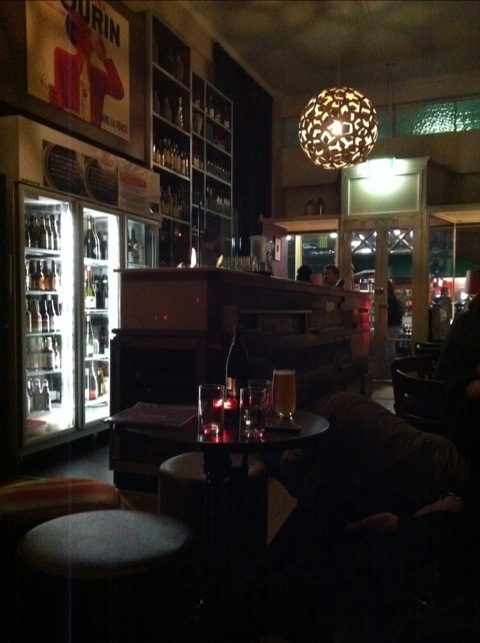 A pre-night-market drink with Noela took us to Cork Wine Cafe, a cosy little wine bar right in the centre of the market precinct in Adelaide. We sat on chocolate leather banquettes surrounded by cushions and friendly patrons, sipping Some Young Punks shiraz from enormous wine glasses and listening to rare groove on the stereo. The people next to us had a pâté grazing plate, which would have tempted us had we not already made dinner plans. I have read some reviews citing pretty bad service, but we were treated well by two friendly staff. Certainly worth a second visit. If the service you received was acceptable, you must have been on a good night. On every one of the five times I have visited, begrudgingly at the behest of accompanying friends, the staff have been snooty, arrogant and just plain rude. I concur with headflash… I’ve never previously experienced anything even approaching the level of rudeness that I endured at the Cork Wine Cafe on my first (and last) visit. Ali and headflash – could agree less. Have been going there regularly for 3 years and couldn’t say better things about the place or the two owners who run it.